I love watching all my favorite bloggers create their Sampler Quilts using different patterns. I watch Anya at Hills Creek Quilter, Stephanie at A Ditchin' Time Quilts and Angela at Country Scrap Quilts create each of their unique Dear Jane Quilts. They are all dedicated to completing their Quilts and it's great watching the progress. 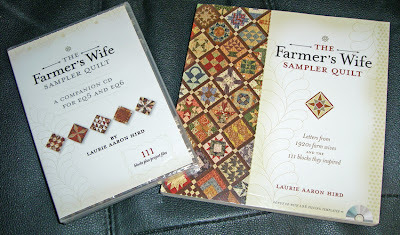 I recently saw another type sampler quilt that I liked that was mostly pieced and I didn't see any applique. I purchased the book and the companion EQ6 CD. So, I'll be reviewing it this weekend and deciding if I want to pursue the challenge or just use the great patterns and templates. I'm pretty sure I won't be able to crank out a block a day, but, we'll see what I can decide upon. It all depends on the long awaited test results for my husband's treatment that ended 3 months ago. Who knew you would have to wait so long to be tested results. Luckily, I have had crafting to keep me busy. We'll take all the prayers you can send for clean results in the testing. Hopefully, it's all gone!! Trish: I hope your husband's tests turned out OK. Just ready all your Farmer's Wife blogs. Very interesting!